Even without Russell Westbrook on the floor for a big chunk of the early part of the season, the Oklahoma City Thunder have found ways to be successful offensively — usually by attacking the basket. That went away for a period of Saturday’s 111-96 loss to Dallas and a day later, Thunder coach Billy Donovan emphasized offensive aggressiveness with his team. Oklahoma City isn’t likely to have Westbrook back Monday when it hosts the Phoenix Suns at Chesapeake Energy Arena. Westbrook was listed as being out for the game, which would be his fourth consecutive game out since suffering a sprained left ankle late in the Nov. 5 win over New Orleans. The emphasis on attacking is especially important for the Thunder, who at 28.8 percent are last in the league in three-point shooting. 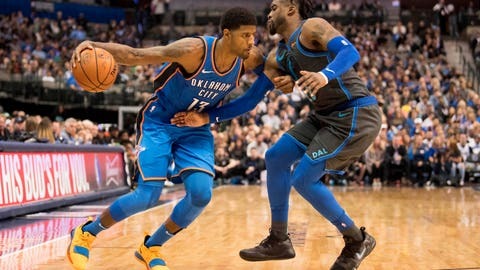 Without Westbrook, the Thunder have had to lean heavily on backup point guards Dennis Schroder and Raymond Felton to generate offense, with mixed results. Schroder scored 19 points but was just 8 of 21 from the floor with three assists against the Mavericks while Felton was just 3 of 12 for seven points. “Sometimes the ball just doesn’t fall for you,” Felton said. The Suns are trying to pick up their first road win after dropping the season’s first five, including one in Oklahoma City on Oct. 28. Phoenix coach Igor Kokoskov wants more aggressiveness out of the first overall pick in last summer’s draft, center Deandre Ayton. “It’s a challenge, but the challenge should give him confidence in a way he should become aggressive and try to execute game play,” Kokoskov told reporters Sunday, referencing Saturday night’s loss at New Orleans and Anthony Davis. While Ayton won’t have a player quite Davis’ caliber to worry about Monday, Oklahoma City’s Steven Adams can put pressure on opposing centers. Ayton, who is averaging 16.1 points and 10.9 rebounds, said he didn’t quite agree with Kokoskov’s assessment. One way or another, the Suns need to find a way to generate more offense. Phoenix, which has lost three straight games, is last in the NBA in offensive rating, scoring 100.1 points per 100 possessions. Phoenix hasn’t been much better one defense, allowing 113 points per 100 possessions.